There is a school of thought, albeit quite small I would imagine, who believe Barack Hussein Obama is a closet Muslim. There will be more than a modicum of paranoia among this disparate group although they apparently do have a champion in the form of billionaire property developer Donald Trump. The fact that Obama is reluctant to march in an army of foot soldiers to defeat the Islamic State militants adds fuel to their fire as they claim this is because he is empathetic to his own kind. 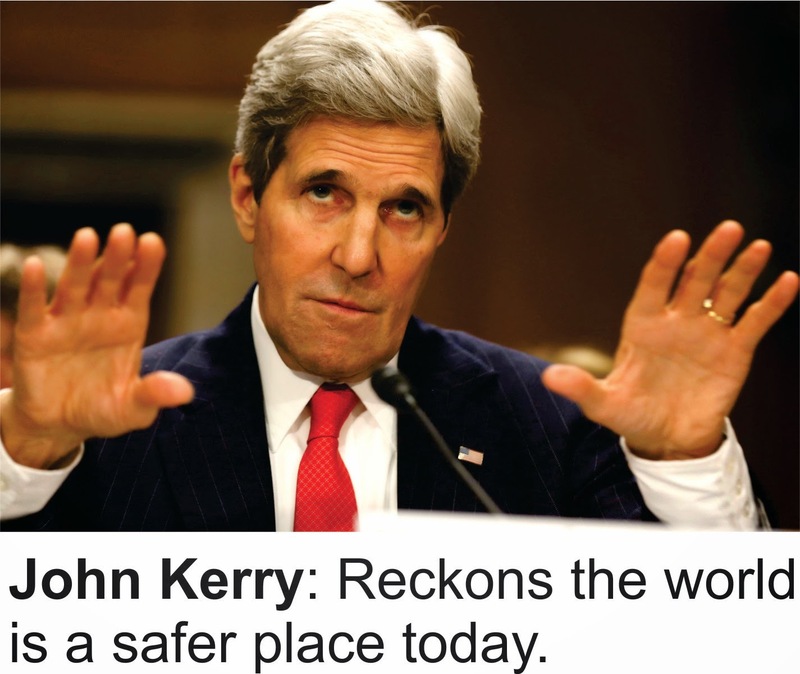 Kerry claimed that social media had highlighted the issues to such a degree that citizens of the western world are more afraid than they need to be. So apparently we can slumber in peace. But that’s not how the citizens of this country saw it when John Key announced that he was sending non-combatant troops to Iraq with some combatant troops alongside to protect them. Although a slim majority of New Zealanders agreed with this decision, many feared there would be reprisals. And when a van innocently caught fire in a Westfield shopping mall in Auckland, shoppers fled the building fearing the worst. The panic ensued because Isis had put out a call to its worldwide sympathisers to attack malls in general and Westfield-branded ones in particular as they believe these are Jewish-owned. I’m anecdotally told that already in this country shopping centres are experiencing a decrease in patronage, but don’t want to highlight this in case it causes a domino effect. Kerry’s soothing comments however were counteracted by America’s Director of National Intelligence James Clapper who declared 2014 the deadliest year for global terrorism ever recorded. Testifying on Capitol Hill he catalogued the growing terror-fuelled violence in stark terms. “When the final accounting is done,” he said, “2014 will have been the most lethal year for global terrorism in the 45 years that such data has been compiled.” Also speaking before the Senate Armed Services Committee he offered statistics that would appear to challenge the Obama administration official’s claims that America and the world were safer places today. Clapper said that in the first nine months alone of 2014 preliminary data from a University of Maryland research unit shows nearly 13,000 attacks killed 31,000 people. Back then to sleepless nights. The discrepancy in the two claims made to the Senate Armed Services Committee occurs because wars kill tens of thousands of people whereas terrorism kills a lesser number, but more brutally, and if carefully staged, can strike fear into the hearts of millions. The Isis terrorists are masters at staging that brutality. The Islamic State militants have something up their sleeve that is virtually undefeatable. They sincerely believe that death is going to propel them to a paradise that offers indescribable rewards of carnal desire. Meanwhile children are being raped and forced into military service and women are being sold into slavery. Their god must be very forgiving. Unfortunately the jihadists know they can pretty well do what they like because the world is reluctant to unite against them. We are now part of a sixty nation coalition that refuses to attack Isil where it primarily lives, in Syria. In her about-to-be released book ISIS - the State of Terror Jessica Stern writes that the Sunni-Muslim-based jihadists want a ground war, they want to fight and die and see this as an apocalyptic battle against Christians and their other perceived enemy, the Shi’ite Muslims. So there’s good news and there’s bad news. I desperately want to believe John Kerry’s palliative assessment of the situation, but his optimism may be misguided and in the long run remembered as being a bit like Neville Chamberlain’s disastrous declaration in 1939: “Peace for our time”.